« Download: Updated Welcome to Europe Info Guide Greece Ready!!!!! 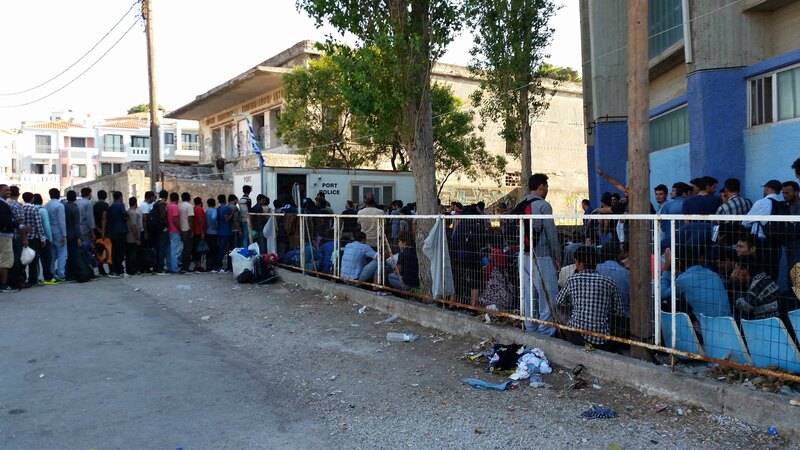 A small Afghan boy is sitting outside a blue tent built up just behind the kiosk in the port of Mytilene. On the other side of the tent there are some other Afghan minors sitting on a blanket on the floor and leaning at the walls of an abandoned swimming hall. It is late in the night. His elder brother has fever. He is climbing out of the tent to join us. 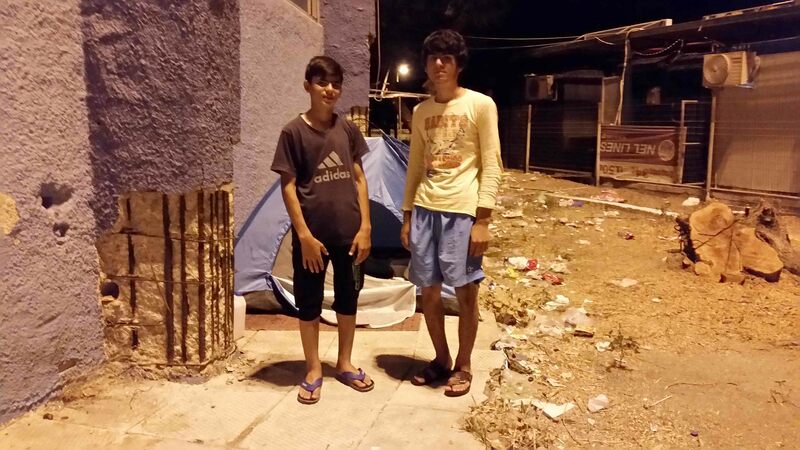 The two underage boys from Afghanistan are camping there already since four nights. 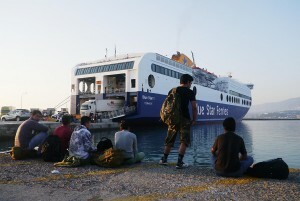 They arrived to Lesvos together with their mother and father and two little sisters. In Moria they registered themselves as adults, as other people advised them to avoid reporting their real ages for the own good. Then the two of them got released alone. A group of activists from the Christian Peacemakers is visiting the two minors twice a day in the port and tries to support them in what they wish most: to reunite with their family. m2 is fenced provisory to keep control of the people waiting. An officer is shouting rudely on the people. “Sit down. Go back. Go back. It’s not good here? Then go back to Turkey!” Every now and then a bus comes and takes the ones registered away. There were already three busses and still people queue. New people arrive constantly. The procedure continues for hours. Just around the corner around 200 people are waiting to buy a ticket for the ferry. Everyone is trying to find out what the ticket costs, how long the boat will take to Athens and where to go next. On the other side of the abandoned swimming hall one can still find a few tents. Some days ago, refugees had build a small tent village just bellow the statue at the rims of the port. Wet clothes were hanging next to the tents to dry under the sun. They disappeared only for new ones to appear slowly and one by one. Near the ticket office an Afghan mother is washing her baby at a public water tap. A hand full of families with small children and babies sit on the ground and watch the ferry arriving. Aside another family is standing in a corner, desperate to find some Euros to be able to leave from the island. The family arrived a few days ago on the island. Similar to most others they also walked more than 40 kilometers to the city to register with the coast guard. 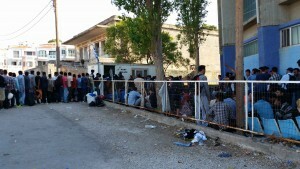 Then they spent five days in Kara Tepe tent camp and one night in Moria detention center. Nowadays in Kara Tepe there are only people from Syria. The police is transferring all others to Moria. There are many families and single men on the former. Just a few meters away from him yesterday a 45 old Syrian collapsed. The Ambulance came and took him to the hospital but he died already during his transfer to hospital. The medical cause of his death is not yet clear, but one thing is obvious, that the lack of medical aid in the provisory tent camp but also in Moria has fatal consequences. The man is the second within a few days, who died due to the absence of any reception system newly arriving refugees currently face in the Aegean. Again today hundreds of people arrive on the island. Amongst others, the Greek coast guard in cooperation with a Norwegian Frontex vessel arrested 79 persons in two dinghies near the coast of the island. 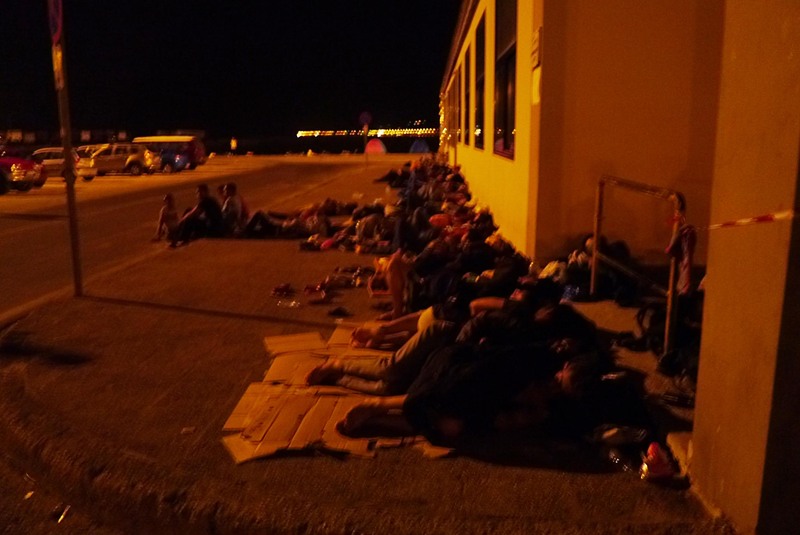 In the night more and more refugees reach the port of Lesvos. They were just released from Moria and left to walk to the city by themselves – most of them in the middle of the night. Among them are women, children, babies, unaccompanied minors, elderly…. There are a few tents near the seaside and dozens of people sleeping inside and next to them. Mothers hold their 3-6 months old babies in their arms to protect them from the cold. In the shadows of the passenger terminal for the Turkey passengers hundreds of people sleep crunched next to each other while a few remain awake to guard their families and friends. The whole port is full of refugees. 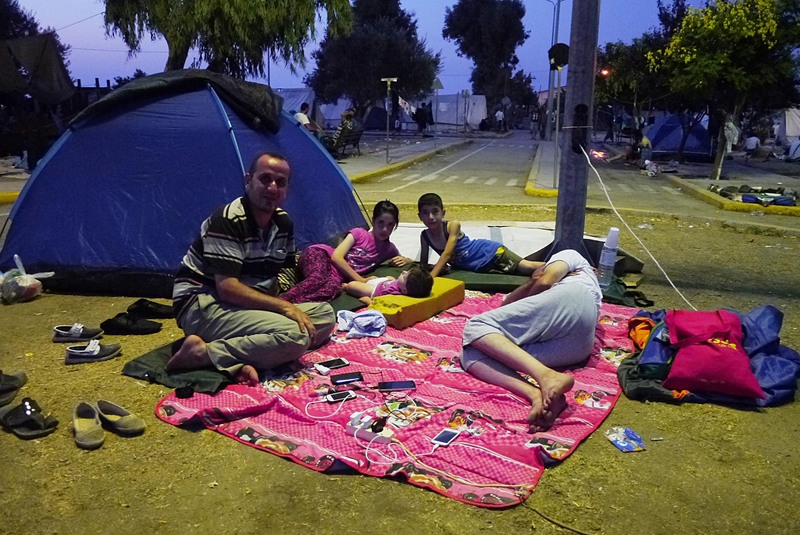 Everywhere: on the banks, near the sea, around the statue on the ground… people are sleeping. Around 600 persons take the ship the next morning and again dozens have arrived newly to queue in front of the coast guards little van. The two little brothers from Afghanistan still wait. 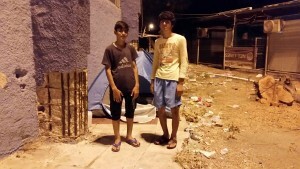 They could be finally convinced to move away from their tent in the port to the open welcome center PIKPA, run by activists of the solidarity group “Village of All Together” in order to be more protected and taken care of. It remains unclear when their family will be finally allowed to join them.